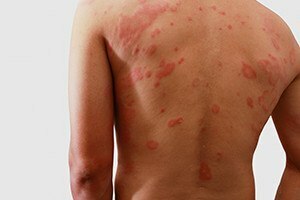 Dermatitis arises when the skin is inflamed, and usually it also involves an itchy rash. The skin that is affected by dermatitis may develop a crust or blister. Eczema is an example of dermatitis, but sometimes it is caused by exposure to certain substances in the workplace. If you suffer dermatitis due to a job in the Boston area, the workers’ compensation attorneys at Pulgini & Norton may be able to guide you in pursuing benefits. Studies show that people who have occupational contact dermatitis tend to have poor outcomes that affect their work, health, and quality of life. In one study of 78 workers with occupational contact dermatitis, 38% of the workers were not working, most of them because of the skin problem. Of the 62% who were working, 32% had changed jobs, mostly due to the dermatitis. In order to recover workers' compensation benefits for dermatitis, you will need to have an examining physician, who has reviewed your medical history and any cutaneous findings, state that there is a reasonable probability that the dermatitis was caused by or aggravated by your employment. Insurers often deny benefits for job-related dermatitis, and it may be necessary for you to file a claim with the Department of Industrial Accidents. Generally, you must file within four years of the date of injury or when you first become aware of a causal relationship between your conditions and your job. Your work need not be the sole cause of your dermatitis in order to receive workers' compensation benefits. Contrary to popular belief and insurer attitude, pre-existing conditions make it more difficult to collect benefits but do not bar them. If work activities accelerate or aggravate an underlying dermatitis, even eczema or psoriasis, this may be enough. Fault is immaterial to whether you can recover. Instead, the issue will be whether your work is a "major" cause of your disability. It need not be the predominant one. Although you do not have to prove fault, the employer or the insurance carrier may dispute your claim. They may claim your injuries are exaggerated or nonexistent or come from some other exposure. There are five stages to the claims process if your employer's insurer denies you benefits. You will be examined by a physician of the insurer's choice, and you may be examined by an impartial medical examiner selected by the administrative judge. The impartial medical examiner will submit a report indicating whether a disability exists due to your job, and the scope of that disability. Workers' compensation benefits that an injured worker may be able to recover include permanent and total incapacity benefits, temporary total incapacity benefits, partial incapacity benefits, medical expenses, permanent loss of function, and disfigurement or scarring benefits. In most cases, permanent and total incapacity benefits will not be available for dermatitis unless it is coupled with other injuries, or the dermatitis is a symptom of a bigger problem. If you suffer dermatitis from occupational exposure, you may be able to recover workers' compensation benefits. However, these claims can be difficult. The work injury lawyers at Pulgini & Norton can represent people in Boston and the surrounding cities, such as Malden, Quincy, and Newton. Call us at 781-843-2200 or contact us via our online form to arrange a free consultation.